Originally intended to be part of the design invitational, this pattern didn't quite get finished in time. But its done now and published on fandominstitches.com so I can share it with you all. Yay! A huge thank you to the wonderful Jo Minvielle who tested this pattern for me in record time. Paper pieced Labyrinth Title - Designed by me, tested by Jo Minvielle. I designed this paper-pieced pattern to complement the quilt layout presented in the Fandom in Stitches Goblin King, a Labyrinth-themed Quilt & Stitch along. It is an absolute monster of a block, finishing at 60 inches long by almost 15 inches tall. The intention was to create a title block that you could put inside the outer border of the quilt, at either the top of the bottom of the original layout. If you are planning on using this block in conjunction with the QAL layout, you might want to add extra sashing around it so the spacing between this block and the character blocks doesn't look too uneven. You will also need to adjust (increase) the length of the outer border strips for the finished quilt. Download the pattern here if you want to give this pattern a go, and don't forget to share pics of your finished work. I love seeing how others interpret my designs - no two ever end up the same. 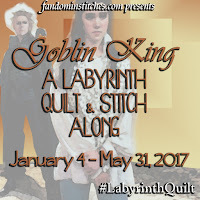 Don't forget also, that all the patterns from Goblin King: Labyrinth Quilt and Stitch Along are available over at fandominstitches.com.